Anticipating increased demand for 3D NAND flash storage in the coming year, Samsung is looking to invest an additional US$2.6 billion to expand production capacities of its NAND factories in China and Korea taking the total investment to US$9 billion by 2019. 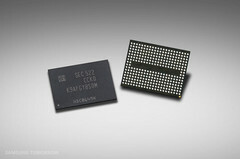 The increased investments are being centered around production of 3D NAND flash, V-NAND flash, and QLC flash memory. Samsung is reportedly investing an additional US$2.6 billion to ramp up NAND production in 2019. The company has invested US$6.4 billion this year on NAND flash memory and the additional money will take the total investment to US$9 billion. The reason for increased expenditure on NAND flash is primary thought to be the arrival of new Apple products in Q3 2018 among others. We already know that Apple will be introducing revisions to most of its products during its September event so the anticipated increase in demand for flash memory is not unrealistic. Despite increased demand, NAND prices are expected to be more more or less stable and are in fact, expected to fall in the long run. There has been an unprecedented demand for flash storage unlike never before. Most laptops are fitted with some form of SSD storage and smartphones, which are traditionally flash-based, are offering higher built-in storage capacities. Samsung is a clear market leader with 37% market share followed by Toshiba at 20%. Other manufacturers also will be looking to ramp up flash memory production efforts as the more and more devices are increasingly moving towards SSDs as their preferred storage medium. In fact, Western Digital will be shutting down its Malaysian hard drive plant in 2019 to focus on flash storage manufacturing. Coming to Samsung's NAND plans, the company will invest heavily in 3D NAND production and also increased production of 5th generation V-NAND with more than 90 layers. While Samsung has a clear lead in V-NAND, Toshiba, Micron, SK Hynix, and Intel will also look to produce 96-layer V-NAND by end of 2019. The investments will mainly focus on increasing the company's NAND production capacities in the Pyeongtaek plant in Korea and the Xi'an plant in China. Samsung will also look to launch quad-level cell (QLC) flash memory that offers higher capacity at a slightly lower performance but should appeal to those who require high capacities. Overall, these developments signal positive signs for customers as the prices of flash storage will decrease as demand shoots up. For suppliers, however, there is risk of running into oversupply and subsequently into operational losses due to underutilization of factories. Memory manufactures will need to carefully match demand and supply to ensure profitable operations while still offering great prices for customers.